Et tu, Robert Kennedy Jr? Russia is blocking release of an internal UN report that apparently shows how pro-government militias in Darfur are making some $54 million per year in gold mining. Police opened fire on peasant protestors at the site of a coal-fired power plant project in the Chittagong district of Bangladesh, killing at least four. Human rights group Global Witness ranked Honduras as the world's most dangerous country for environmental defenders, with 109 slain over the past five years. Four of Peru's presidential candidates, including far-right front-runner Keiko Fujimori, have been implicated in the "Panama Papers" revelations. Last week, the Ecuadorian government announced that it had begun constructing the first of a planned 276 wells, ten drilling platforms, and multiple related pipelines and production facilities in the ITT (Ishpingo-Tambococha-Tiputini) oil field, known as Block 43, which overlaps Yasuní National Park in Ecuador's Amazon rainforest. Coupled with the recent signing of two new oil concessions on the southern border of Yasuní and plans to launch another oil lease auction for additional blocks in the country's southern Amazon in late 2016, the slated drilling frenzy is part of a larger, aggressive move for new oil exploration as the country faces daunting oil-backed loan payments to China, its largest creditor. Yasuní National Park is widely considered one of the most biodiverse places on the planet. It has more species per hectare of trees, shrubs, insects, birds, amphibians, and mammals than anywhere else in the world. It was designated a UNESCO Biosphere Reserve in 1989, and it is home to the Tagaeri-Taromenane, Ecuador's last indigenous people living in voluntary isolation. The controversial drilling plans were met with protest at the Quito headquarters of state-run Petroamazonas, the company charged with developing the field. Ecuador averaged a spill per week between 2000 and 2010, which doesn't bode well for drilling in a national park. This article was drawn from an interview with Anabela Lemos, and conducted, edited, and condensed by Simone Adler for Toward Freedom. Anabela Lemos is co-founder, campaign coordinator and board member of Justiça Ambiental, the Mozambique branch of Friends of the Earth. To corporations, the forest is only business. To communities, the forest is everything: trees, medicine, culture, spirituality. Land-grabbing and the removal of communities from forests and land breaks the community, displaces access to food and water, and uproots the connection to nature and [local] knowledge. If the community structure is broken, if the land—the means of food production—is lost, we lose everything. In Mozambique, where 80% of the population is campesinos—traditional, family farmers—companies are taking the best, most fertile land and moving people to land that can’t grow anything. For example, the coal mining project in the Tete province relocated people from the fertile soil by the Zambezi River, with the promise of houses and two hectares of land per family. They were moved to an arid place with land that can only grow stones, as they say, losing access to the land and river their lives depended on. Over the last five years, close to 4.8 million Syrians have fled the conflict in their country by crossing into Jordan, Lebanon and Turkey. But as the war drags on, neighbors are sealing their borders. Forced from their homes by air-strikes and fighting on multiple fronts, the vast majority of Syrian asylum seekers now have no legal escape route. Earlier this week, EU leaders reached a hard-won deal with Turkey aimed at ending a migration crisis that has been building since last year, and that in recent weeks has seen tens of thousands of migrants and refugees stranded in Greece. But the agreement turns a blind eye to the fact that even larger numbers of asylum seekers are stranded back in Syria, unable to reach safety. Syrians hoping to apply for asylum in Europe first have to physically get there. EU member states closed their embassies in Syria at the start of the conflict, and even embassies and consulates in neighboring countries have been reluctant to process visa and asylum applications. When Syria’s war erupted in March 2011, it was initially relatively easy for most refugees to leave the country. Those without the means to fly poured out in waves of tens of thousands across land borders into Jordan, Lebanon, and Turkey. But one by one, these exits have been restricted or closed off entirely. WATER: COMMODITY OR HUMAN RIGHT? Both viewpoints are playing out in the wake of the Flint, Michigan, water crisis. Last month I wrote about the rhetoric following the crisis, noting that many critics were echoing the human right to water perspective. One Michigan state representative even proposed a bill that would declare water to be a human right. To many observers, the crisis was caused by water managers holding financial considerations above public health and environmental justice. Indeed, Flint's decision to switch from water provided by the Detroit Water and Sewerage Department to water provided by the Karegnondi Water Authority was largely a financial one, as the move was projected to save the city $19 million over eight years. When the Flint city council voted to return to Detroit water, the city's emergency manager opposed the move on financial grounds. To many, water cannot be managed with such financial tunnel-vision, and a human right to water might rebalance water managers' priorities. All Saints Ukrainian Church on East 11th Street, with its colorful mosaic facade, was the unlikely venue on Saturday Jan. 16 for the metro area Berber community's celebration of their traditional new year holiday, Yennayer. On the wall of the church's downstairs meeting space, paintings of orthodox saints formed a backdrop to the flag of Kabylia—the increasingly restive Berber region of Algeria's northern mountains. By an interesting chance, it has the same blue and yellow colors as the Ukrainian flag. It was still a little odd to hear strains of North African music and eat delicious couscous in a Ukrainian church. Yennayer has taken on a special significance in the current Amazigh cultural renaissance—especially for the inhabitants of Kabylia and their worldwide diaspora. The highlight of the celebration at All Saints Church was an exposition by Sadi Melbouci, an Amazigh businessman and political leader who flew in from his home in Denver for the affair, entitled "Kabylia's Path to Freedom." Tired of what they see as second-class citizenship under a regime officially committed to Arab nationalism, more and more Kabyles (as the indigenous Amazigh of the region are called) view themselves as a colonized people, and are calling for independence from Algeria. Joseph Daher is a Syrian-Swiss Marxist intellectual with a PhD in development at the University of SOAS, London. He is also a member of Solidarités in Switzerland and of the Revolutionary Left Current in Syria. What do leftist Syrian intellectuals think about the current crisis, Assad's future, the intervention of world powers, the activism of forces representing alternatives, and the role of the Syrian Kurds? This text contains Daher's response to two questions posed to better comprehend the events in Syria from an alternative point of view. What is your analysis of the Russian government's air-strikes in Syria since September 30? The objectives of these air-strikes are clear: save and consolidate the political and military power of the Assad regime. In other words, crush all forms of opposition—whether democratic or reactionary—to the Assad regime under the so-called "war on terror." Most targets are civilians and factions of the Free Syrian Army (FSA) still existing. About 100,000 civilians have been forced to flee their regions because of Russian bombings. Russian bombings also destroyed dozens of hospitals while doctors and patients were killed in these raids. In areas such as the outskirts of Aleppo, the bombings in some cases even benefited the the Islamic State (IS), thanks to a lightning breakthrough against factions of the FSA disoriented by Russian strikes. Moreover, Russian strikes are operated with the direct collaboration of the US and Israel. 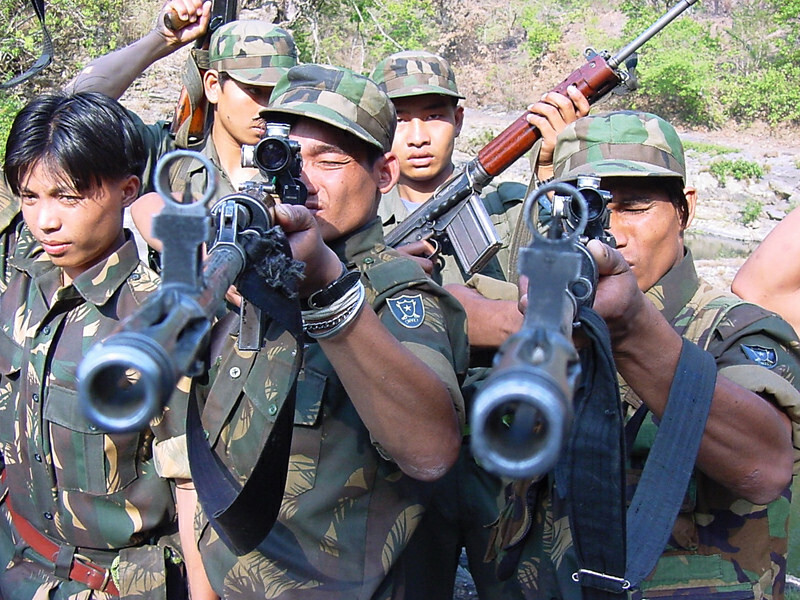 As most leaders of United Liberation Front of Asom (ULFA) and other banned militant groups of northeast India have now joined in peace talks with the authorities and are bargaining for amnesty from their past misdeeds, families of victilms of the insurgencies express concern about whether they will get justice. ULFA, which chased the dream of an independent nation of Swadhin Asom in what is now the Indian state of Assam, engaged in numerous acts of extortion, kidnapping and even in brutal killings. Journalists and common people sometimes targeted for their critical comments about the rebels. One notable example is the brutal assassination of journalist Kamala Saikia, an elderly teacher, veteran of India's indpendence struggle and devotee of Gandhian principles in the town of Sivasagar, who became a commentator on social issues facing his conflicted state. He was taken away by ULFA fighters on the night of August 9, 1991; his body was recovered next morning on a roadside with signs of torture. He was among 20 journalists, commentators and editors of Assam who lost their lives to political killings over the past two decades. Not one perpetrator has been brought to justuice. HARGEISA/GAROWE — Two consecutive seasons of drought across northern Somalia are driving tens of thousands of pastoralists into hunger and debt. Abdilahi Mohamed had 20 cattle in August. Only five now survive. He herded his animals 250 kilometers—from his home in Faraweyne to Banka Geriyaad, northwest of Hargeisa, capital of Somaliland region—in the hope that the Hays rainy season (December to February) had generated enough fresh pasture there. "But before I got there people had already moved in and finished it all," he told IRIN. It's a similar situation in the autonomous state of Puntland, to the east. Mohamoud Ahmed told IRIN by phone from Sanag region, one of the hardest-hit areas, that he had "lost a number" of his herd. "My entire family is now in a critical situation: no water, no food, no nothing. Young ones and the elderly are suffering a lot. Sometimes I buy a drum of water for $120—when I can afford it." Pfc. England convicted in Abu Ghraib abuse case —scapegoat?